Which states in the US to stay in wintertime?? Where to travel & camp in wintertime??? I am a brand new fulltimer from Canada and I was quite shocked when the campgrounds and provincial parks just closed down around Labour day. Fall is for me the best time to camp, but it gives me really a hard time to even find an open campground now in late September! So where would you guys recommend to travel in the US? I've never been so far South, I would appreciate a moderate climate and a safe environment and sort of affordable lifestyle. Comments for Which states in the US to stay in wintertime?? You don't necessarily have to travel so far South West. Last year we wintered in the Carolina's. November in the North Carolina Sand Hills. We stored our MH in Jackson Springs N.C. while we went home to Pennsylvania for Christmas. January was spent in North Carolina, February we were in Greenville South Carolina and Savannah Georgia. February/March we were in Charleston then Myrtle Beach South Carolina. It was amazing. Only had snow one time but it was gone in a flash. Walked along the beach in late February in the 70's. We're doing the same thing this year. Myrtle Beach S.C. has Sno-Bird accommodations. Which states in the US to stay in winter. We love the winters along the Colorado river on the Arizona border with Nevada and California. Winters are sunny and warm and the scenery along the river is awesome. A cheap way go is to find a National or State Park looking for volunteers for the season or part of a season. We spend 3 months at a park as maintenance volunteers and get a beautiful RV site with full hookups and laundry free for working 3 days a week. To look for volunteer positions go to www.volunteer.gov/gov and click on a state on the map to find open positions for that state. 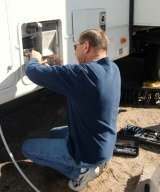 A popular winter RV destination is in Tucson, Arizona. The winter weather is beautiful and easy to deal with. There are several RV parks in the immediate area. My current one is called Beaudry RV Resort. It is located off I-10 at exit 264B. Extremely nice with lots of amenities, even a licensed massage therapist! Happy Traveling!